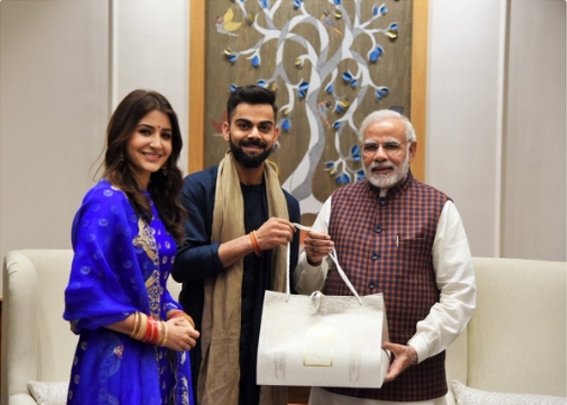 Indian cricket team Captain Virat Kohli and his wife actress Anushka Sharma met Prime Minister Narendra Modi on Wednesday. Both of them invited the prime minister for their reception on Thursday to be held in Delhi. Indian team captain Virat Kohli married Bollywood actress Anushka Sharma in Italy on December 11. After that they were on their honeymoon. Only few and important guests were present in the marriage including Sachin Tendulkar and Yuvraj Singh. Virat and Anushka went to Finland for their honeymoon. After returning home, the newly married couple, Virat and Anushka, met PM Modi and invited him for a reception to be held on Thursday. This information was given through the tweets released by the Prime Minister’s Office.